You can go from the airport Leipig/Halle (LEJ) to the main station by train. It takes 15 minutes and and costs 3,00 - 4,00€. Enter the time and date of your arrival on the homepage of the German railway company and find out the exact departure time of the trains. The conference sites are located at the Campus Augustusplatz in the city center of Leipzig. The talks will be held in the Seminargebäude (NSG) and in the Hörsaalgebäude (HSG), Universitätsstraße 5. 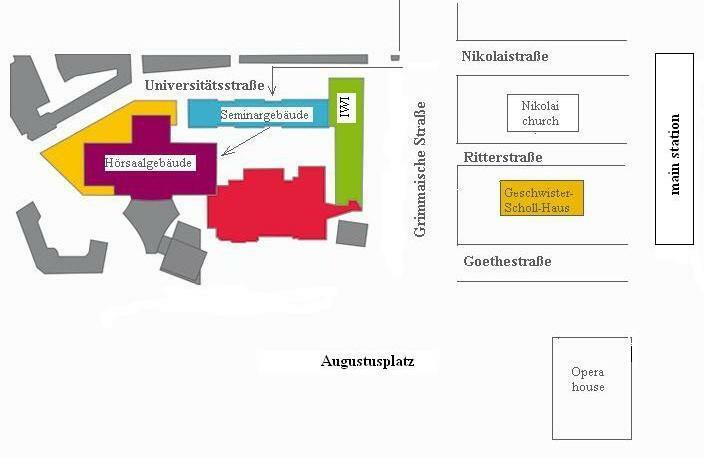 On Saturday the plenary sessions take place in the Geschwister-Scholl-Haus, Ritterstraße 8-10, 3 minutes to walk from the campus. You can access the conference sites if you get off the tram at the stops Augustusplatz or Hauptbahnhof (main station). All trams pass at least one of those stops. Unfortunately, the street name Universitätsstraße is not indicated. It is the small street to the left of the bookstore "Lehmanns", a big white building with green letters that you cannot miss. If you prefer walking: follow Nikolaistraße, Universitätsstraße, Grünewaldstraße, Windmühlenstraße, Bayrischer Platz (blue line on the map). It is a 20-minutes-walk from the main station. You can find the route map of Leipzig here. for a ticket Einzelfahrt press 1 Zone Erwachsener and then 1 Zone Leipzig. for a ticket Kurzstrecke press Kurzstrecke Leipzig Einzelfahrt. if none of the first two options is available: ask the tram driver. Tickets have to be validated in the tram (yellow boxes). tram tickets: There is a ticket machine at the stop Elsterpassage. Besides, you can buy tickets in the shopping center Elsterpassage: follow the sign LVB, Tickets & Service. For details see section Public transport above.